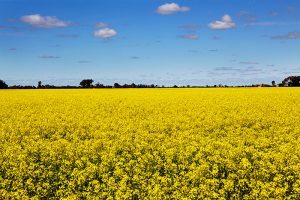 One of Australia’s iconic agricultural assets will undergo a multi-million dollar upgrade this winter. 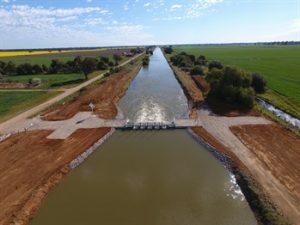 Extensive modernisation works will start next week on Lawson Syphon, a massive river management infrastructure asset channelling water from the manmade Mulwala Canal under the Edward River, 10 kilometres east of Deniliquin. The syphon upgrade is one of 14 projects to be completed during winter under Round 3 of Murray Irrigation’s Private Irrigation Infrastructure Operators Program (PIIOP), which has received funding approval of up to $114.8 million from the Australian Government. The critical upgrades include concrete remediation works and replacing wheel-operated regulating gates with automated, telemetry-enabled hardware. The works have been awarded to Ertech, whose Managing Director Alec Courts met onsite with Murray Irrigation CEO Michael Renehan at the start of May. Mr Renehan expects the upgrade to extend the iconic asset’s operational life for another 50 years. 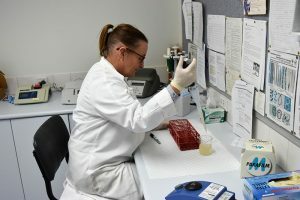 “The Lawson Syphon is critical to our operations,” he said. The 700-metre long structure is currently being drained to allow engineers to replace dilapidated concrete aprons at the syphon. The syphon’s gates will also be replaced with automated, stainless steel infrastructure, provided by AWMA – Water Control Solutions. Construction of the Lawson Syphon was completed in 1955 after taking 16 years to build. Work started in 1939 but was halted only weeks later following the outbreak of World War II. When work resumed in 1945, project managers were faced with repeated flooding of the Edward River and labour shortages.